Around this time of the year we typically write about MLP seasonals. That’s because the “January effect” has been an enduring pattern of investor activity, far more pronounced than in the broader equity market. Prices would reliably dip in November before firming in December and shooting higher in January. This was due to the combination of income-seeking individual investors with K-1s. Because of the additional tax preparation costs, if you’re planning to sell an MLP in January, you might as well act in December and avoid one more K-1. Similarly, a December purchase delayed until January also avoids a K-1. Quite possibly, the natural inclination to take stock of life, including investments, around the holiday season resulted in a decision to allocate cash to MLPs. 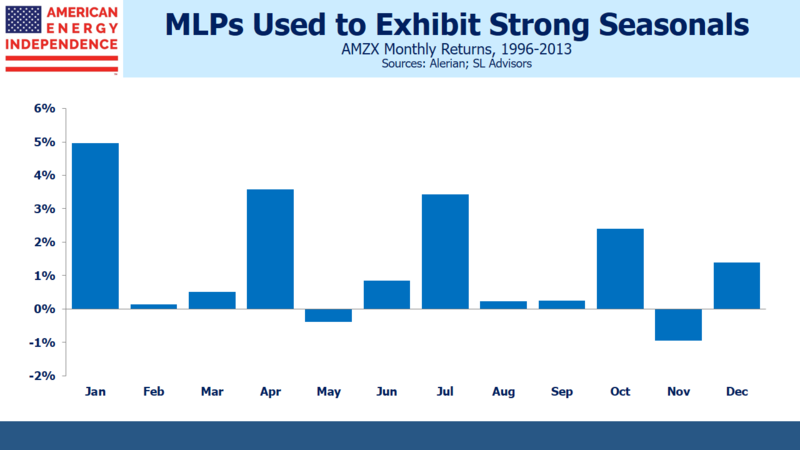 Two years ago, in Give Your Loved One an MLP This Holiday Season, we noted the historic pattern and why purchasing MLPs in early December had worked so consistently. Although the year-end pattern was most pronounced, there’s also an intra-quarter one. MLP investors love their income. Distributions tend to be declared in the first month of the quarter, payable a few weeks later. Sellers tend to hang on long enough to be a holder of record for the quarter, creating the Jan/Apr/Jul/Oct cycle of positive months. Much has changed over the past five years. MLPs can no longer be relied upon for steady income. 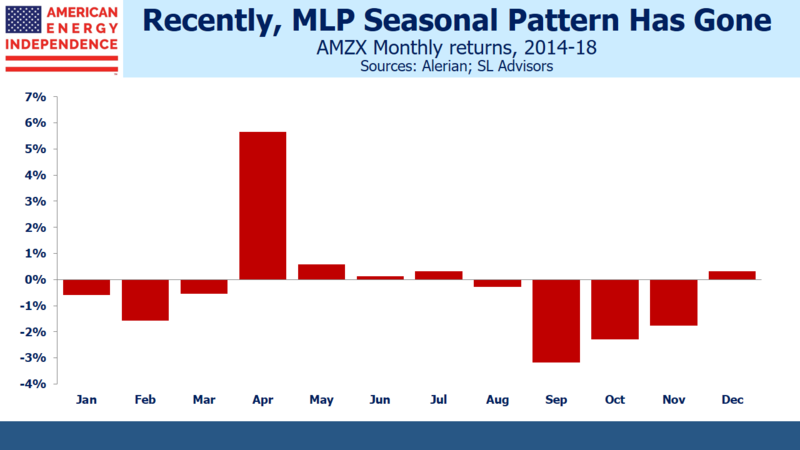 The Alerian MLP ETF (AMLP) recently cut its distribution again, resulting in a 34% cumulative reduction since 2014. Not only did some MLPs with high yields cut their dividends outright to fund growth projects and reduce leverage, but many were purchased by their much lower yielding parent companies, providing “backdoor” distribution cuts to MLP. The consequent betrayal of income-seeking investors has had many casualties, including still-depressed sentiment oblivious to attractive valuations. Another change has been the breakdown of the seasonal pattern. Having been mistreated, income-seeking investors no longer act so predictably. Over the past five years the January effect has completely gone. So has the quarterly pattern – years ago, when the sector was stable and fairly unexciting, holding your investment a few more weeks so as to get that extra distribution wasn’t inordinately risky. MLP investors have learned to appreciate risk differently, and it’s clear that the calendar bears very little on the timing of today’s buyers and sellers. What’s striking about the past five years is both the randomness of the monthly returns, as well as that the average month is -0.3%. From 1996-2013 it was +1%. The loss of the seasonal pattern is further evidence that the traditional investor, with her predictable habits developed over years of happy results, has left. It’s why the sector is cheap, because the former buyers have fallen out of love. Thus spurned, large MLPs have converted to corporations in search of new suitors, such that less than half of U.S. midstream infrastructure now retains the MLP format. Many believe the MLP model is irretrievably broken. Eventually, and possibly quite soon, rising dividends will draw in a new set of buyers. They’ll buy corporations that were formerly MLPs, as well as some of the remaining MLPs. They’ll rely on discounted cash flow analysis (see Valuing MLPs Privately — Enterprise Products Partners). They’ll look beyond the betrayals (see Kinder Morgan: Still Paying for Broken Promises). They’ll find a sector with 11% free cash flow yields before financing new projects, and dividend yields of 6%+ growing at 10% (our 2019 forecast for the American Energy Independence Index). We are long EPD and KMI. We are short AMLP.